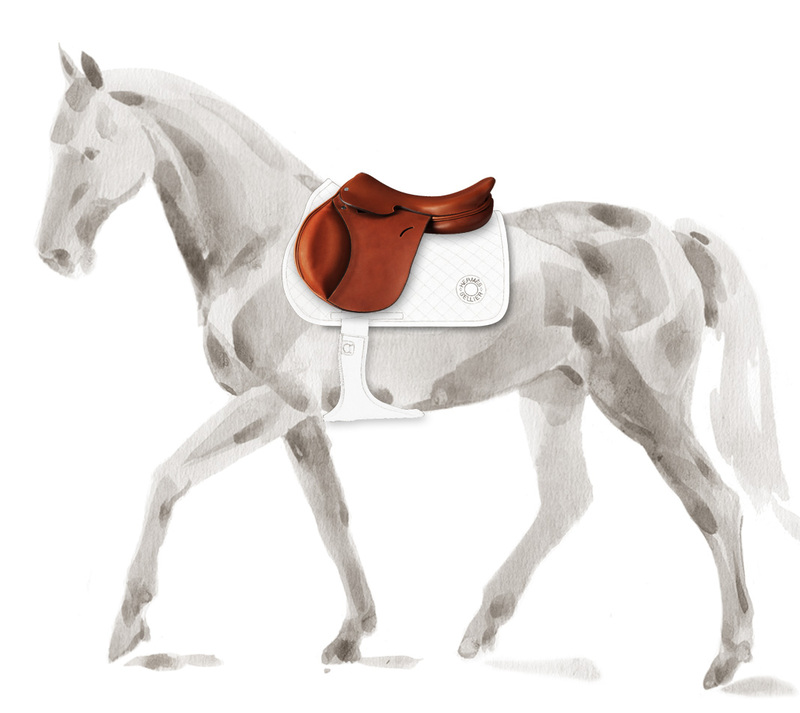 Ever since founder Thierry Hermès first began producing some of the finest harnesses and bridles for the carriage trade in Paris, comfort has reigned supreme in the brand’s equestrian collections. For it’s latest piece, the Cavale saddle priced at £5,500, the French luxury brand asked champion show jumper Simon Delestre to help with the ergonomics. Meanwhile, a single craftsman works to the exact measurements of both horse and rider to ensure the perfect fit. And don’t worry if you and your trusty steed are not quite showground ready. This seamless calfskin seat also makes an excellent general-purpose saddle. To choose, test and fit yours, contact one of the Hermès specialists in store. 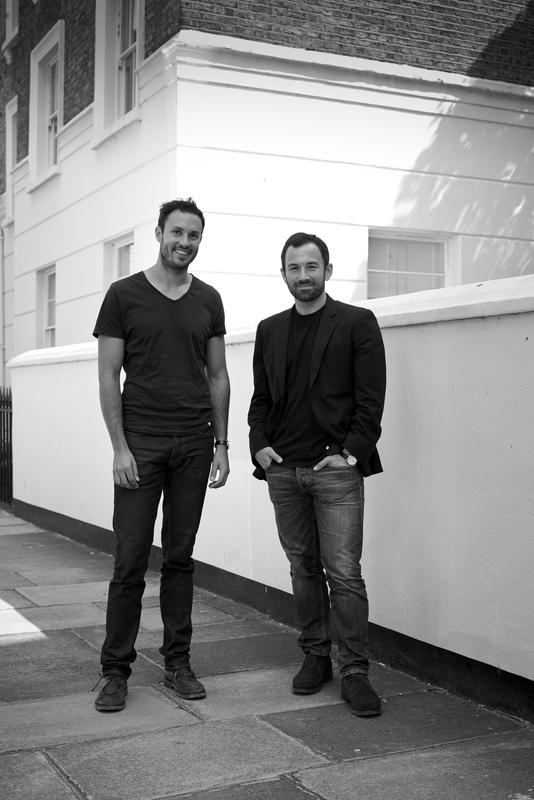 Samuel Bail and Abel Samet are the creative duo behind London-based leather goods label, Troubadour. They first met whilst working at Mayfair financial advisory firm, Lazard, where, after lamenting about the lack of durable business bags, they decided to embark on a journey to create their own. Today, to the delight of globetrotters everywhere, their exquisite handcrafted designs are sold around the world. And for those shopping on Bond Street, a selection of pieces can also be found at Thom Sweeney on Bruton Place. Vegetable-tanned leather, derived from the finest tanneries in the Italian region of Tuscany, underpins each unique piece. As Abel notes: “This tanning method is an all-natural process that creates exceptional leather, so that our products wear beautifully, last for years, and actually look better with age. We work with highly skilled artisans, whose leather-working techniques have been around for generations and therefore stand the test of time.” Samuel is also quick to note a blend of old-meets-new. “By combining these techniques with many modern innovations, each piece is more functional and technical than the bags our grandfathers once carried,” he adds. Meanwhile, several of Troubadour’s existing products have proven to be much more popular with women than initially expected. This pleasant surprise inspired Samuel and Abel to develop a line of women’s bags, which will launch this summer. This is the place for mouth watering and healthy breakfast bowls. Make them yourself with soaked oats, coconut yoghurt, fresh berries, quinoa cereal and lots of toppings. The coffee is great as well. We suggest adding some coconut yoghurt and almond butter on top. Brown’s is ideal for a morning meeting. We especially like the comfortable chairs and its relaxed, quiet setting. The tea is always good and is served beautifully. We have a very active team and enjoy a morning ride around Richmond Park and a weekend ride into Kent. Rapha, though not in Mayfair, is where we pick up most of our cycling kit. The clothing is thoughtfully designed, comfortable, wears well and looks good. Many of the early Troubadour discussions were held over dinners here. It provides consistently great food and great wine in a casual setting. This is one of our favourite tailors in London. It boasts a great team and a super strong ready-to-wear collection, featuring everything from suits and sweaters, to ties and a selection of our latest Troubadour bags. 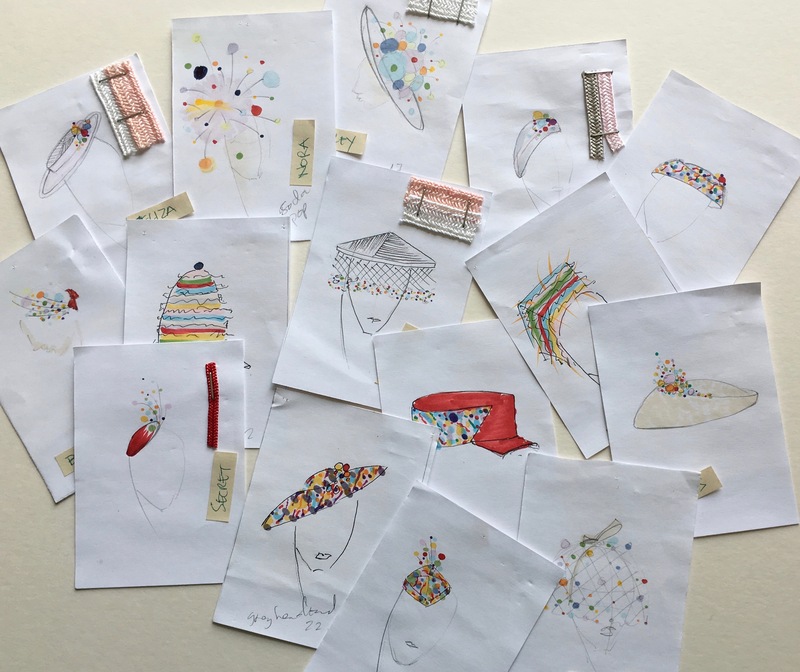 No doubt visitors to the Fenwick hat department will have been tickled pink by the latest offering from London-based milliner, Harvy Santos. In particular, his aptly named ‘Fizzy Pop’ collection features raffia boaters, netted pillboxes and wide-brimmed Audrey Hepburn styles. But it is his playful use of colourful baubles, ruched silks and fluffy pompoms, which makes them so memorable. “I probably drank too many fizzy drinks as a child and probably still do, since I can never say ‘no’ to champagne,” says Harvy. “There’s a certain crazy joy that comes from a sugar rush. 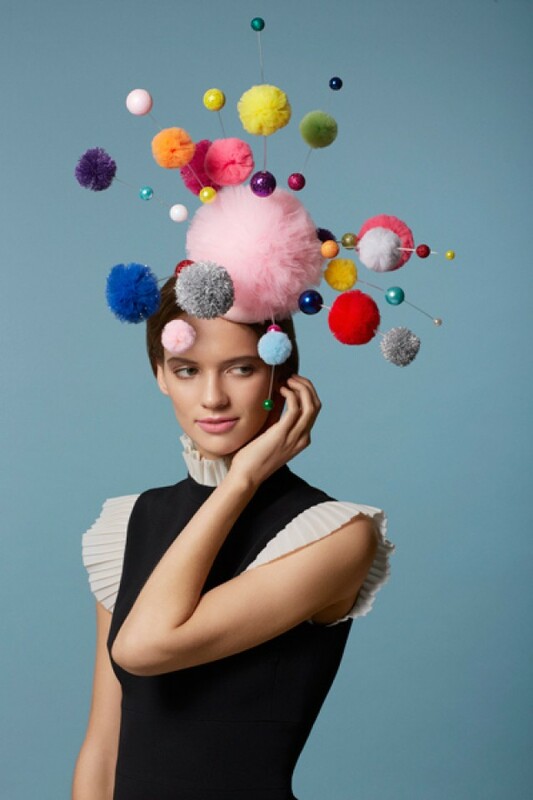 I think most of us can remember that feeling, the thrill of which I wanted to capture in the form of a hat.” Indeed, his latest collection has both a graphic and comic sensibility mixed with a sense of childlike fun – hence the pompoms suspended on wires. 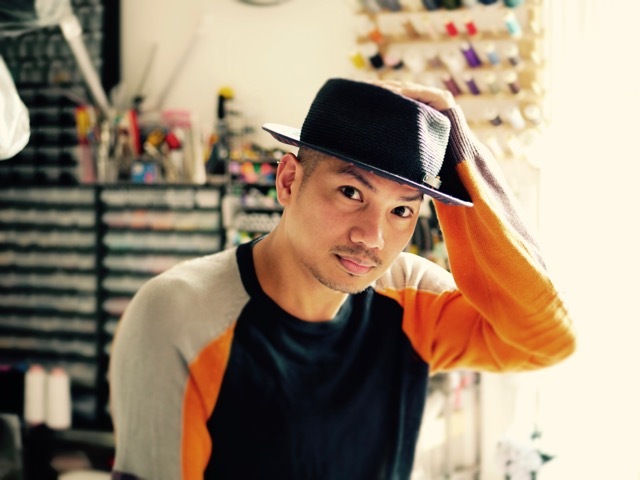 Born in the Philippines, Harvy started out as a ballet dancer in Hong Kong before going on to study millinery in London. Prior to launching his own label, he created hats for The Royal Opera House and worked with top British hatter, Stephen Jones. Today, Harvy fuses traditional millinery techniques with new materials in couture and hat collections from an atelier in North London. BSN: How would you advise someone buying a special occasion hat for the first time? H.S: Firstly, try on as many hats as you can. If you are matching a hat with a dress or another accessory (bag or shoes) bring them with you. In terms of face shape, if you have an oval and/or heart-shaped face, you could wear almost anything. If you have a round face, avoid wearing wide-brimmed hats on a horizontal, tilt it if you can – it’s usually flattering. Lastly, depending on what event you are wearing your hat to, I would suggest you think comfort. If you’re going to Royal Ascot, you will be there all day. You wouldn’t want to fumble and worry about your hat — you are there to have fun so comfort is key. BSN: How important is hair and make-up when wearing a statement headpiece? H.S: Hair and make-up also complete the entire look. I suggest getting a good hairdresser involved, especially if you have opted for a headpiece that has fiddly headbands or wires. The hairdresser can make those disappear, which would make your hat float on your head magically. BSN: Britain is renowned for its hat-wearing culture. How does this influence your work? H.S: A lot! I think the fact that the UK has a hat wearing culture inspires me more to create a new way of wearing tradition. In the UK, a lot of women dare to be different and some are naturally quirky and a bit eccentric and I love that. This then makes me push the boundaries a little without losing being stylish and elegant. BSN: If you had to pick any fashion brands on Bond Street that would compliment your hats – what would they be? H.S: A MaxMara jumpsuit would dress-up my ‘Nicole’ coolie hat. If you choose to wear a dress from Prada, then my ‘Sabrina’ beret would look fun and elegant and suit any special/formal occasion. Anything from the ‘Fizzy Pop’ collection would look fun paired with a trouser suit from La Perla, or even with their lingerie/nightdresses if you are going for the underwear-as-outerwear look of course! When Burberry’s London Fashion Week show commences on the evening of September the 19th, for the first time ever, each piece will be available to buy straight from the runway. So, if you can’t wait until next year for your favourite new season trench, bag or scarf to land in store get ready to hit click. The runway presentation also coincides with the launch of Burberry’s new show venue located in the heart of Soho. 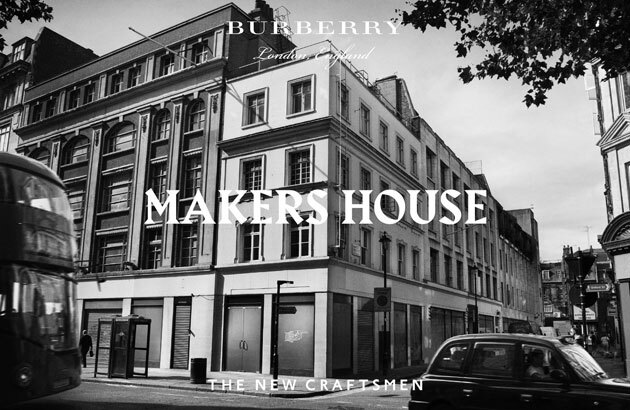 Called Makers House, it is the result of collaboration between the British luxury brand and British craft collective, The New Craftsman. Prepare to be wowed over the course of one week (Sept 21-27th) as the country’s finest craft makers bring the inspiration behind Burberry’s new ready-to-wear collection, through a changing programme of daily demonstrations and installations. And since Christopher Bailey’s inspiration is Virginia Woolf’s Orlando, expect plenty of leatherwork, embroidery and lacquer technics on show here. Of the talented British makers carefully selected by The New Craftsman to show off their handiwork here, several stand out. Take Pedro da Costa Felgeuiras for instance. All of Pedro’s contemporary work is imbued with his ever-growing personal library of pigment and lacquer knowledge. 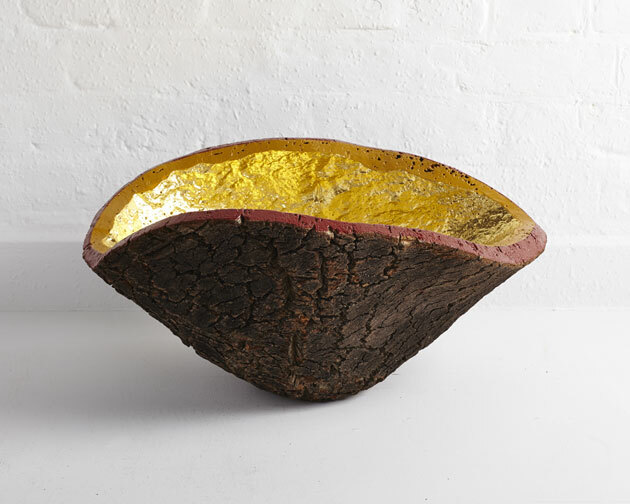 For Makers House, he will demonstrate traditional paint and lacquer techniques on an array of vessels that specifically reference the Burberry collection and its Boho inspiration. 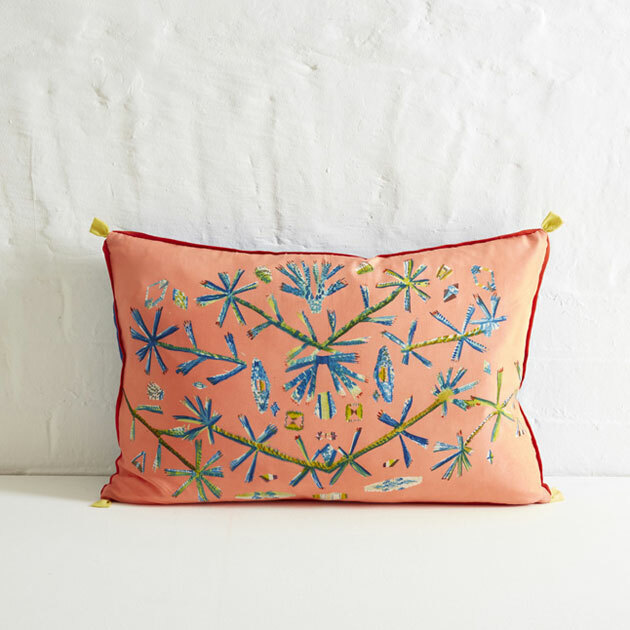 Meanwhile, Rose de Borman’s iconic aesthetic of surface pattern and embellishment can be seen in a series of stunning silk cushions inspired by flora and fauna. She will also be putting on a display, live printing exclusive silk scarves, which will be available to purchase. 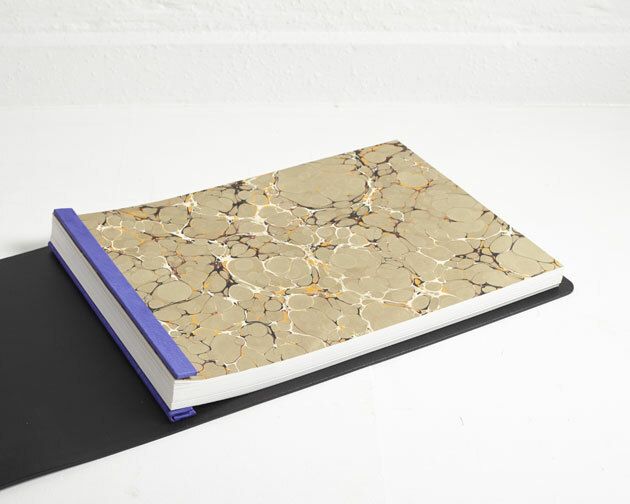 Finally, East London brand ‘Bespoke & Bound’ will also be here bookbinding live. Its team of makers will draw on Burberry’s rich military history as they combine traditional materials such as bridle leather with a modern aesthetic. Now that’s a wrap! The last time legendary shoe designer Manolo Blahnik opened a store it was 1972 and fashion was embracing maxi dresses, knee socks and Bowie’s Ziggy Stardust alter ego in a big way. 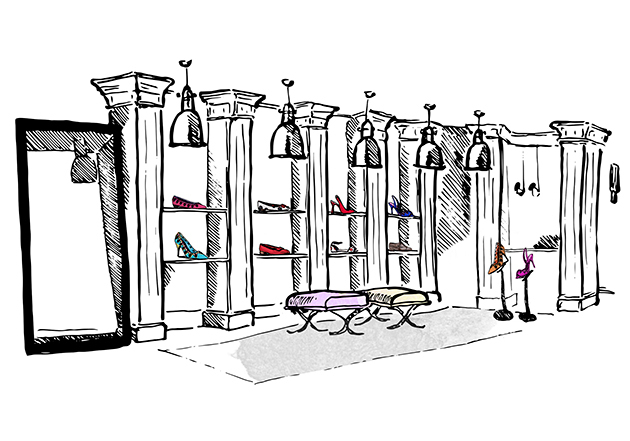 The Chelsea flagship still remains at 49-51 Old Church Street, but some 44 years later Blahnik has decided to open a second store – right in the heart of Mayfair’s Burlington Arcade. The new bijoux, double fronted space measures in at 1,000 sq ft and houses both men’s and women’s shoes, as well as the recently launched handbag collection. The interior is awash with delicate design touches. Here, shelves lined with soft grey-coloured pony skin are offset with candy-coloured ottomans and silk lamps. Blahnik’s love of the classical period can be seen in the Corinthian columns, which support walls throughout the space as well as the oversized mirrors. There is also a private room on the top floor where special orders for customised pieces are taken. At the opening bash earlier this month, guests including historian Mary Beard, model Yasmin Le Bon and fashion director Michael Roberts mingled with a chic, Manolo-touting fashion crowd. 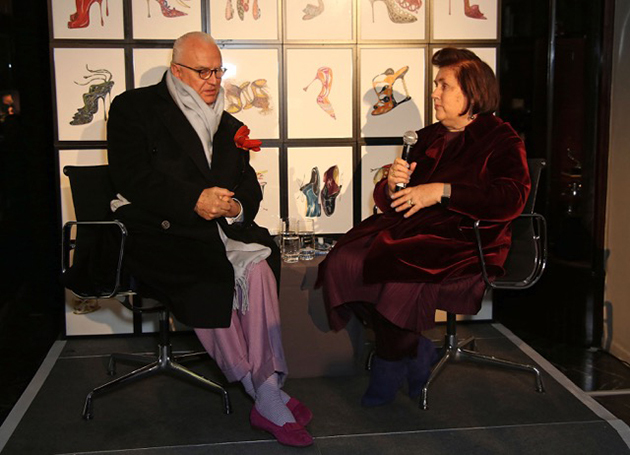 During the event, Vogue’s international editor Suzy Menkes staged an interview with the designer, who true to form, was dressed in a dapper lilac-coloured suit and natty bow tie. Burlington Arcade has been undergoing quite a revival lately, with brands such as Chanel and Frederic Malle all taking up residence. 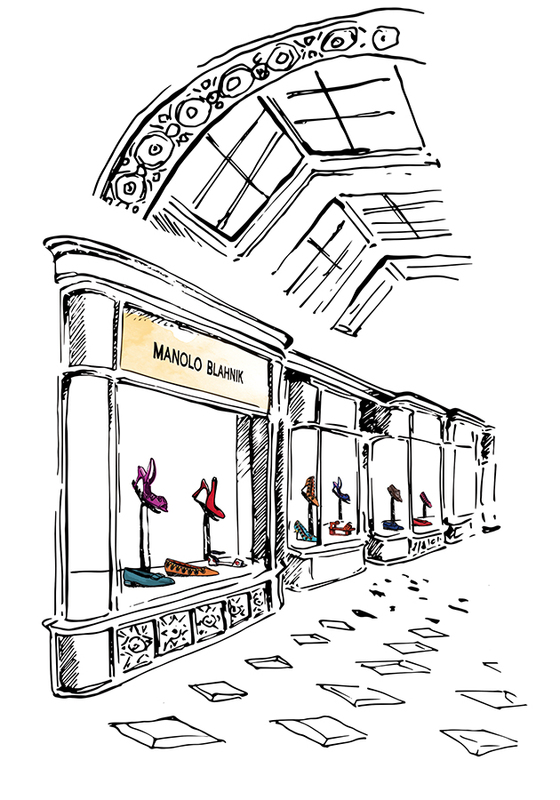 In total, the building houses around 40 boutiques and it is clear to see that Blahnik is delighted with his new home and neighbours. Built in the 19th Century by British architect Jamie Forbert, the arcade has always been one of his favourite London landmarks. “I have adored the Burlington Arcade from my very first visit to London as a teenager,” he says. “It has that intimate feeling and one always feels welcome, especially when the Beadles greet you at the entrance. It is an elegant place with history and tradition and the shops that occupy it share the same qualities as I find essential in beautiful handmade products. Honestly, I could not think of a better place to be”, says the shoe maestro. And neither could we! From the Rio Olympics to Euro 2016 it promises to be quite a year for major sporting events. Furthermore, if the style pundits are right, menswear’s recently coined ‘athleisure’ trend will continue to make the leap from track and field, to next season’s runways. As for the pursuit of the body beautiful, what better way to kick-start your New Year’s exercise regime than with Berluti’s luxury fitness kit? 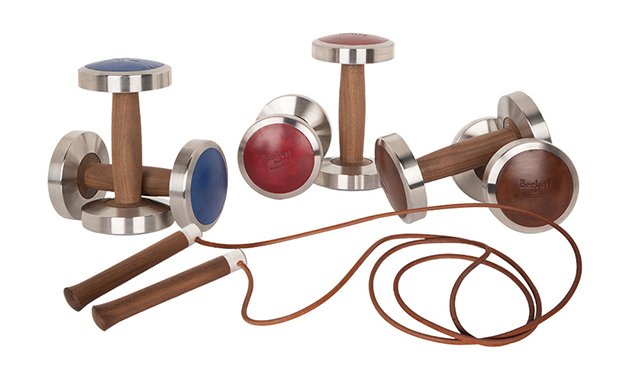 The Paris-based menswear brand has teamed up with German high-end fitness manufacturer Hock Design, to create this set of minimalist dumbbells (£860) and lightweight skipping rope (£340). One glance at the oiled walnut handles and vegetable-tanned leather rope is enough to set your pulse racing. 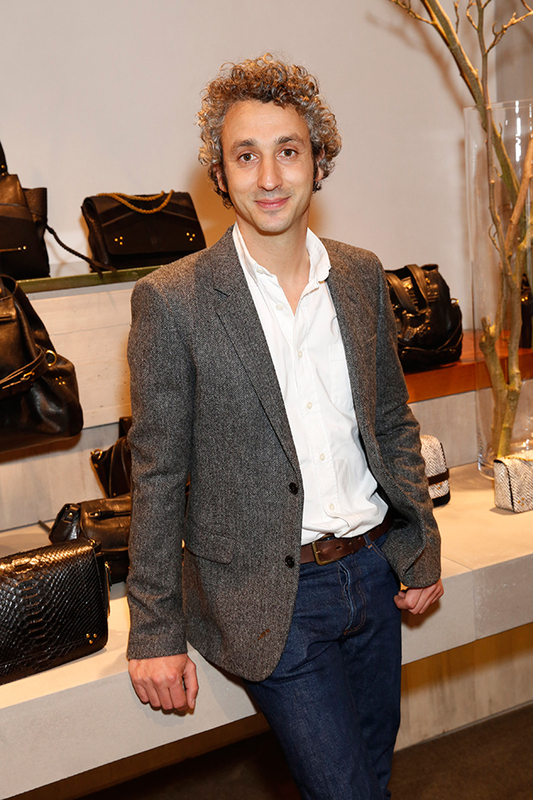 “I design for women who lead a normal life – handbags which are as practical and useful as possible to them,” says French accessories designer Jérôme Dreyfuss at the opening of his new London store. Set in a former bank at the end of Bruton Street facing Berkeley Square, the gleaming, new flagship is the perfect showcase for his signature slouchy totes and shoulder bags cut from the softest leathers. The amiable designer with his mop of curly grey hair adds: “It is all about the lightness and the softness of the bags as well as the functional details.” These include built-in flashlights, which illuminate the inside of bags. He tells me that the inspiration for such practical touches stems from his female friends and his wife who just happens to be the fashion designer Isabel Marant. “In a way I’m lucky they all kept losing things – keys, lipstick, pens… as it made me provide an intelligent solution with my designs,” he muses. And here’s another quirky fact. Each bag in this season’s collection has a male name intended to be their owners ‘indispensible’ life partner. 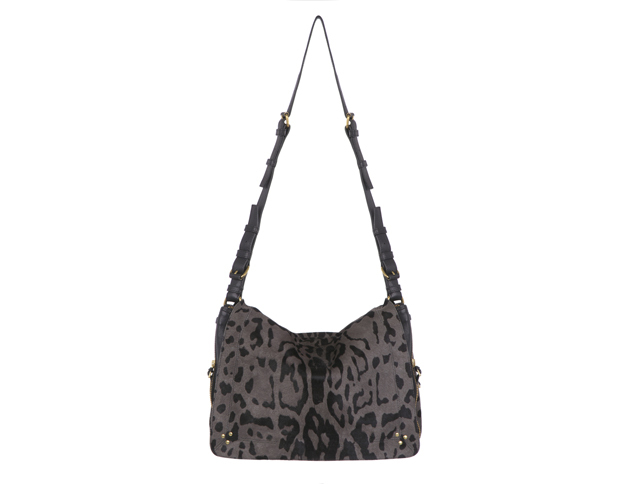 There’s ‘Mario’ for example – a fringed suede shoulder bag – and ‘Albert’, another handy number cut from leopard print ponyskin. Both styles have my pulse racing. Dreyfuss also has stores in New York, Seoul, Tokyo and Taipei, but London is his first European store to open outside of Paris and judging by his enthusiasm, he couldn’t be happier to be here. Tonight the store is thronging with a stylish home crowd. Guests include; fashion illustrator Daisy de Villeneuve and Royal Ballet soloist, Eric Underwood. 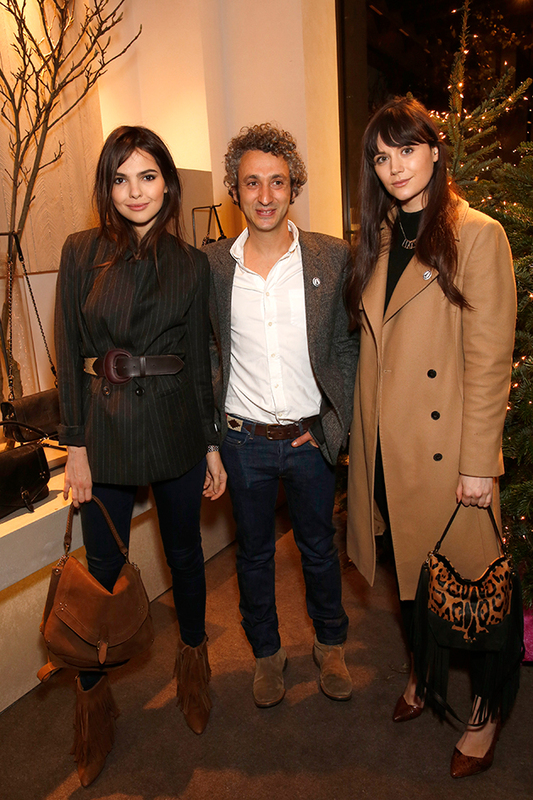 Elsewhere, I spy models Lilah Parsons and Doina Ciobanu along with stylist Kim Hersov and celebrity PR Salvo Nicosia. As for the store itself, while the structure of the former property has remained intact, the space has been reconfigured to reflect the modernist spirit of the ‘50s and ‘80s. There are high-rise vestibules, inspired by the work of Italian architect Carlo Scarpa, father of the Brutalism movement. So what does he like most about his new London space? “I really love the wood slatted window screens. When it is really sunny outside, the shadows from the trees in Berkeley square flicker around the store.” My eyes however, are fixed firmly on the contents of the shelves.